August 2009 ~ I Can Do That! One of the ice cream flavors in an Ice Cream parlor in Singapore that G over at Kitchenmaus mentioned is called Wassup Babe which has, you guessed it, Wasabi. I like wasabi with Japanese food but never imagined it will taste good in ice cream. I have made Black Pepper ice cream before which is not unusual and wasabi doesn't sound any more weird than chicken wing, crab, or octopus ice cream. The wasabi flavor is distinct and surprisingly really good but the wasabi sting is absent. Maybe it cools off immediately on the tongue or I should have doubled the amount of wasabi powder. I like it with ginger thins and I'm also thinking of making it into an ice cream sandwich with chocolate chip cookies. What do you think will go well with wasabi ice cream, candied eel? In a medium saucepan mix milk and wasabi powder, heat the mixture to scalding. In a small bowl, beat the egg and sugar. Add the hot milk while stirring continuously. Return the mixture to the saucepan and cook, stirring constantly, without boiling until custard coats the spatula. Strain into a 4-cup measuring bowl, cover, and chill in the refrigerator for 2 hours. Stir in the heavy cream. Process in an ice cream maker. Transfer into an ice cream container and freeze until firm. 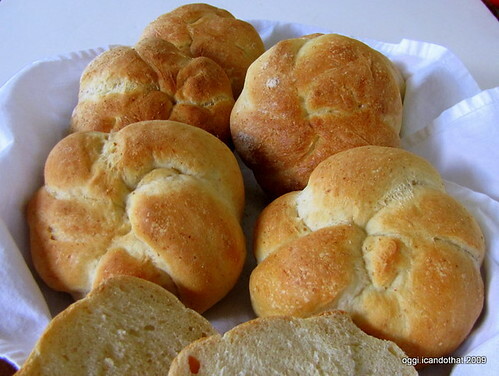 The Bread Baker's Apprentice Challenge 16: Kaiser Rolls. I can't remember the last time I bought these sandwich rolls which used to be a favorite in our house. I have forgotten about them after I started baking all of our bread almost two years ago. I never thought they would be so much fun to make and they're very yummy too. 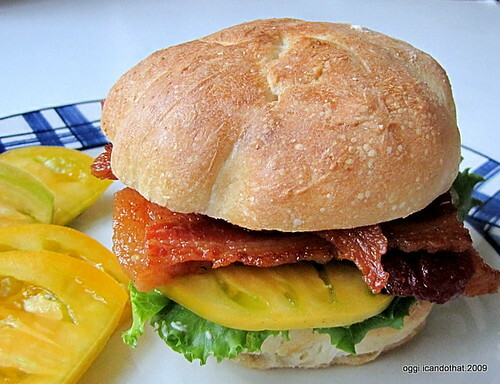 I love its chew and the crunch of the crust when toasted, excellent for BLT or simply smeared with whipped cream cheese. The dough is very easy to work with but shaping the rolls using the traditional folding method takes a bit of practice. After the shaped pieces have risen for 10 minutes I had to re-shape them because the design disappeared. I remedied that by dusting the bottoms with lots of rye flour and pressing harder in-between folds. Sorry I didn't take photos of the process but you can watch this [rather fuzzy] video of a baker applying karate chops on the dough. I folded 4 of the rolls and the other 5 dough balls I shaped into knotted ropes. 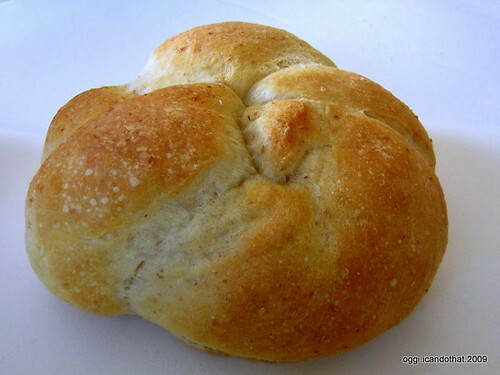 I like the looks of the baked folded rolls better, they are prettier, more rounded and even. 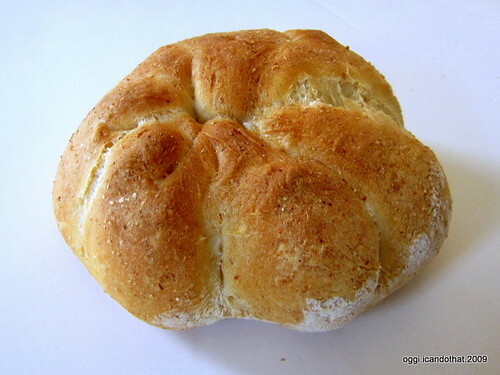 Two of the knotted rolls were misshapen, they came out sort of oval-triangular and one has a slight bump on one side. I don't know if I should get a stamp for easier and faster shaping next time I make these, all you do is shape into rounds and press. The stamp also retains the round shape of the rolls. On the other hand, I love the rustic appearance of the rolls. Although I love poppy and sesame seeds, I didn't bother to top the rolls because they will just fall off and get scattered all over when they are sliced. I also prefer the clean look of the rolls without them. 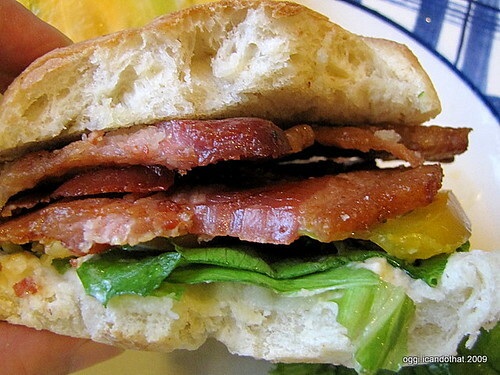 Here's my recipe for smoked home cured bacon. It's very rare to find where I live whole slabs of pork belly so I used thick pieces instead. I used Twinings® lapsang souchong tea available at most grocery stores. The tea gives a smokey flavor without being overwhelming. Soaked applewood chips are also very good with bacon. Mix the dry cure, maple sugar, and garlic powder. Spread the cure on the pork belly evenly. Place the pork pieces in a gallon freezer bag and refrigerate for 5 days, turning the bag every day to cure evenly. Rinse pork under running water and pat dry with paper towels. Open the teabags and place all the loose tea leaves in the middle of the roasting pan, discard the bags. Place the rack on the pan and the pan on top of the stove. Turn the heat to the lowest setting, place the pork on the rack, cover tightly with aluminum foil and smoke for 1 hour. Remove the pork, let cool, and store in the freezer. Slice and fry until crispy. I heard about a layered cake-flan from a Filipino reader of my blog a year ago but have never tried making it. The flan when finished cooking and flipped over is supposed to have a layer of fluffy chiffon cake at the bottom and caramel custard on top. Googling for tips on how to make the cake flan I found the Filipino recipe for Kalabasa (squash) Flan and made that instead. The recipe has 5 ingredients: 1 cup condensed milk, 3 eggs, 2 cups cooked and mashed squash, vanilla extract or key lime juice, and sugar for the caramel. The flan is very easy to put together and bake; I nuked the squash for 3 minutes, then took about 10 minutes to mix together. The finished flan is like pudding but tastes as delicious as a regular flan. Very yummy. When I saw a very tiny butternut squash at the grocery store I thought it was the perfect size to make into a pumpkin flan. I adapted the recipe by using half-and-half in place of condensed milk, adding a third of a cup of sugar and 2 teaspoons of calamansi juice. Mash the squash and set aside. Caramelize sugar until golden brown and pour evenly on the bottom of a flan mold. In a medium bowl, mix half-and-half, sugar, eggs, and flavoring until thoroughly combined. Stir in mashed squash. Pour into the prepared mold. Bake in a bain-marie in a preheated 350°F oven for 40 minutes to 1 hour, or until set. Refrigerate overnight or for 4 hours before unmolding. After eating a few slices, I think I may have found our daily bread, it's The Bread Baker's Apprentice Challenge recipe 15, Italian Bread. I love everything about it, from the wonderful aroma to the slightly chewy crust and soft [milky] chewy moist delicious sweetish crumb, this is the perfect everyday breakfast or sandwich bread. Although it takes 2 days, most of it while the biga is resting in the refrigerator, the whole baking process including shaping is super easy. I will tweak and experiment with this recipe perhaps using sourdough starter along with instant yeast, and maybe adding a little whole wheat or rye flour. I'll be making it regularly with or without milk until I get tired of it or another superb recipe comes along. 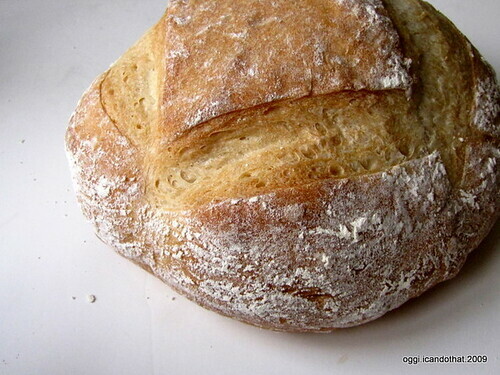 For now, this is my favorite bread. 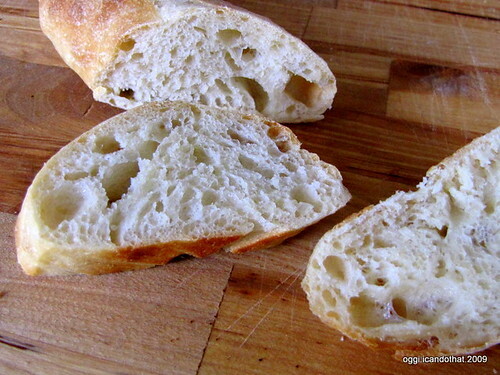 I was never interested in baking Italian bread before because the loaves I've had from grocery stores and bakeries were bland and the crumb dry and fluffy. Thanks again Nicole for creating this challenge because I never would have tried baking it on my own and would not have known that homemade Italian Bread is so very yummy. 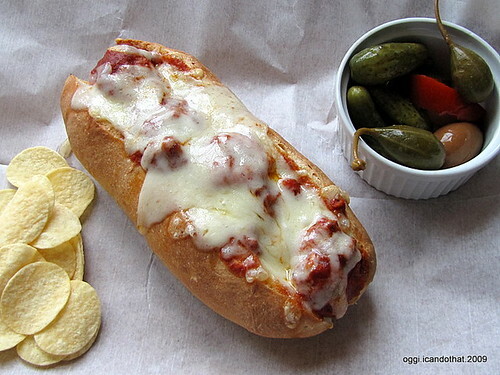 I made six 4-ounce hoagie rolls and the rest of the dough into a 14-inch loaf. The rolls and loaf both had good oven spring. While browsing for recipes that have shishito peppers, I found one that uses the red mildly hot ones in a ganache filling for S'more Macarons. I adapted the recipe adding ground chipotle for extra zing. The cookies are crunchy, sweet and delightfully spicy. Make the macarons: In a medium bowl, mix graham cracker crumbs with cinnamon and stir to combine. Place ground graham crackers on a cookie sheet and bake, stirring once, until toasted and fragrant, about 10 minutes. Cool, then put graham cracker mixture into food processor with confectioner's sugar. Grind to a fine powder, set aside. Finely grind brown sugar in a blender, set aside. In a mixer with a whisk attachment, beat egg whites and salt until foamy. Slowly add brown sugar, and continue mixing to a glossy medium soft peaks. Gently fold graham cracker mixture into meringue in two or three additions. Once combined, continue to fold until batter has deflated to a glossy, homogeneous mixture with soft peaks. Transfer batter into a disposable pastry bag, snip off the tip. On a parchment lined baking sheet/s, pipe even-sized rounds about 1 to 1½ inches in diameter and ¼ inch high, spacing the cookies 1 inch apart. When baking sheet is filled, firmly bang cookie sheet on a flat surface twice. If any peaks are still sticking up, pat peak gently with a lightly moistened fingertip. Allow to sit for 60 - 90 minutes for the cookies to settle slightly. Bake cookies in a preheated 350°F oven for 10 - 14 minutes until cookies are firm on top and just starting to brown on the edges. Cool on cookie sheets. Make the ganache: Place chopped chocolates in a glass bowl. In a small saucepan heat cream and spices to scalding and pour over chopped chocolate. [If using shishito, use 7 tablespoons of cream, heat cream, peppers, and spices to scalding then let steep for 30 minutes, reheat to scalding then strain cream before adding to chocolate.] Let sit for 3 minutes. Using a spatula, mix until cream and chocolate are combined. Leave on the kitchen counter for 1 hour or until firm with a frosting-like consistency. Assemble the cookies: Pairing cookies of similar size, create 2 rows of tops and bottoms. Pipe about 1 teaspoon of ganache onto the bottom of 1 cookie and place its partner on top. Refrigerate a few minutes before serving. Cookies can be stored for up to 2 days in an airtight container in the refrigerator. Bring to room temperature before serving. 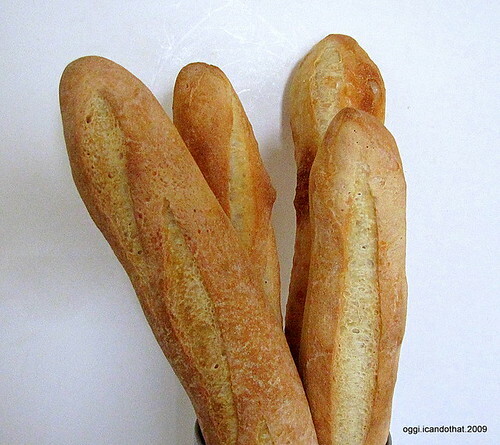 The Bread Baker's Apprentice Challenge 14: French Bread. 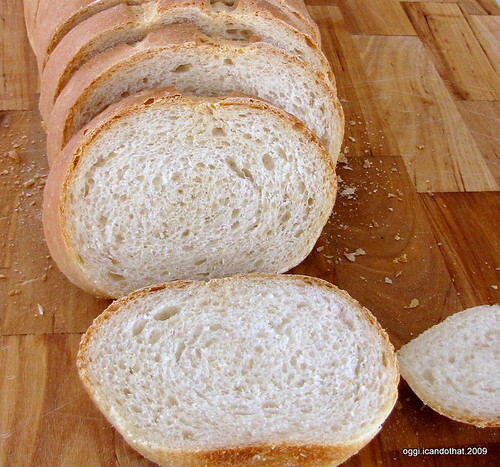 This is the first BBA bread I baked a few years back. 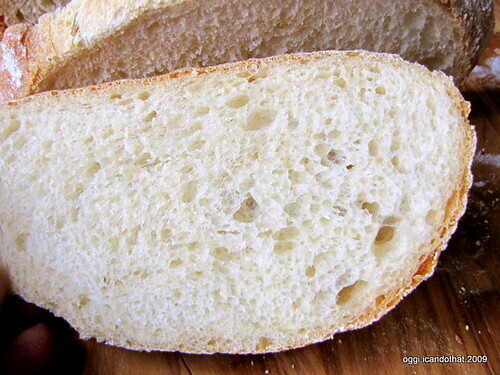 The recipe is not perfect by all means because the loaves it makes do not have the much preferred and coveted open crumb. 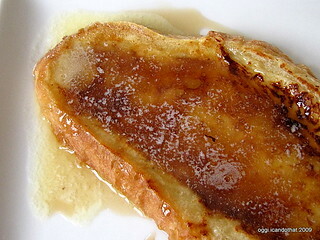 But I come back to this recipe often because I love that it is flavorful, preparation is super easy and uncomplicated, and sometimes I want a more tender tighter crumb usually to make into French Toast. In my opinion this recipe not only makes the best French Toast but the best croutons and garlic bread as well. In other words I love this bread, tight crumb and all. 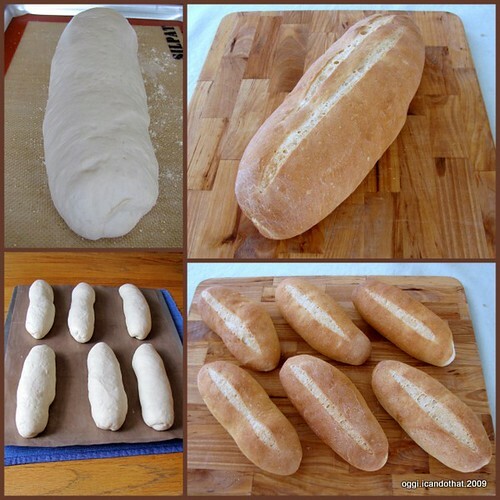 I could have baked a more open crumbed French bread by altering the method, for example, applying the French fold instead of kneading, or any other methods available online or in baking books. But that would mean NOT following the recipe as written which IMHO would defeat the purpose of this challenge. 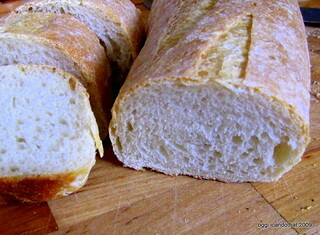 For comparison this is PR's no-knead stretch-and-fold slack dough French bread recipe which makes delicious baguettes that have a more open crumb and thin crispy crust. The recipe requires half the time and effort as the BBA's. The recipe will be in his upcoming book Artisan Breads Everyday to be released end of October 2009. Lasang Pinoy Sundays is a food photography meme, Filipino style, is hosted by SpiCes. I'm sprinkling some fun [and color] this week. I don't normally put sprinkles on my ice cream or cupcakes but I keep a few containers of assorted colors and flavors including chocolate, butterscotch, and cinnamon. The only ice cream I have in the freezer is lychee frozen custard and chopped candied ginger as topping would be best but they won't pop out visually since they have the same hue as the ice cream. Chocolate sprinkles don't match the flavor so I used the bright colored unflavored sprinkles. I feel like a kid again while eating the ice cream. Drain and finely chop lychee, reserve the syrup. Combine the cream, milk, ½ cup of the reserved syrup, and sugar in a saucepan or double boiler; heat until warm and the sugar is completely dissolved. Add 1 cup of the cream mixture to the beaten egg yolks while whisking lightly. Gradually pour the egg mixture back into the cream mixture while continuing to whisk lightly. Cook over medium heat, stirring constantly with a rubber spatula, until the spatula is thinly coated with the mixture, about 8 minutes. Do not allow to boil or the custard mixture will curdle. Stir in the lychee and almond extract if using. Transfer into a container, let cool on the kitchen counter for 20 minutes, cover with plastic film, and chill in the refrigerator overnight. Churn using an ice cream maker. Drain lychee reserving ½ cup syrup. Finely chop lychee, leave to chill in the refrigerator. 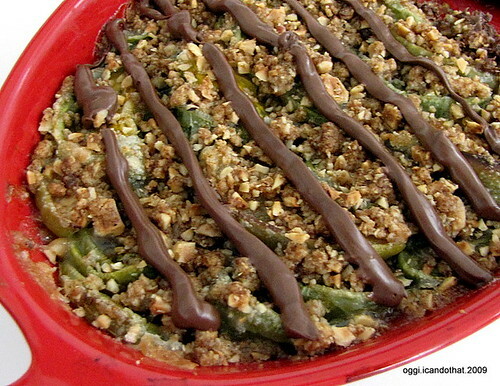 Sprinkle gelatin over reserved syrup and let stand 5 minutes. In a medium saucepan over medium-low heat, scald milk. Turn heat off and add soaked gelatin, and stir until thoroughly dissolved. Add sugar and mix well. Let mixture cool in refrigerator. When cooled, add half & half and chilled lychee. Freeze in ice cream maker. Let's sing a song of love for Julia. It's her birthday today. Ox, beef, or pork tongue stew is a popular dish in the Philippines because Filipinos love their offal. When I first saw and tried this dish as a child I was freaked out; it felt like I was eating my own tongue. I never ate nor cooked the thing again until about 5 years ago and this is only the second time I made this dish. I sliced the meat and fried them a little before briefly cooking in the sauce as opposed to stewing the whole tongue in the sauce. It takes a long time to boil the tongue but it came out very tender and delicious with baby portabella/crimini mushrooms. Next time I'll pickle some pork tongues for Italian style sandwich. Rinse tongue in water, brush well, and place in a large pot, then add water to cover. Turn heat to high and boil tongue for 2 minutes. Drain and rinse the tongue again in water. Rinse the pot, put back the tongue and add water to cover. Boil tongue with onion, carrot, bay leaf, salt, and black peppercorns. Bring to a boil, reduce to a simmer, cover and cook for 2 - 3 hours or until tender. Transfer the tongue to a cutting board, tent with aluminum foil and set aside to cool. Strain and reserve the stock. Peel and discard the tongue's skin. Cut the meat into ¼ to ½ inch thick slices. Heat 1 tablespoon butter and fry the slices until light brown. Melt the remaining butter and olive oil in a large saucepan over medium-high heat. Saute the onion until well browned, about 5 minutes. Stir in the garlic and saute an additional 2 minutes. Add the mushrooms and bay leaf and saute 2 minutes longer. Add the flour and stir fry for 2 minutes. Slowly add the reserved stock, stirring frequently. Then add the tongue, reserved stock, and thyme. Simmer, covered, for 5 minutes. Taste the sauce and adjust seasoning. Serve hot with steamed rice. During my two pregnancies in the perpetually hot and humid Philippines, I had saba bananas in syrup with shaved ice and milk almost every other day to cool me off. Not halo-halo which is too rich, just sweet saba, ice, and milk. I could have eaten just milk and sugar on shaved ice and I would probably have been happy anyway. Ripe saba banana, in my opinion, is the only kind of banana that pairs very well with shaved ice and milk. Lasang Pinoy Sundays is a weekly food photography meme, Pinoy style, hosted by SpiCes. Let's CHILL! A week ago strong winds broke a branch of one of my tomato plants bearing a few green tomatoes. 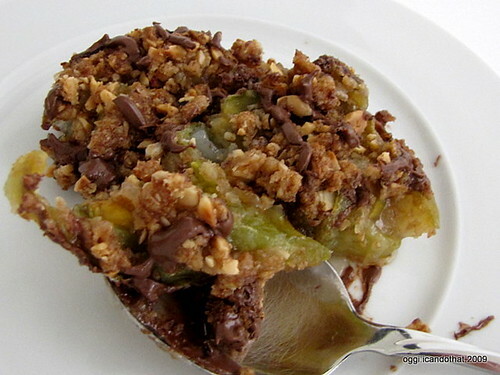 Since there wasn't enough to fry I sliced them and together with two granny smith apples I made them into a fruit crisp. The flavor combination of slightly tart apples, sweetish tomatoes, and hazelnuts is amazing, very very yummy. These green [yellow variety] tomatoes are surprisingly sweet and there isn't a hint of tartness. Being a tomato fiend (I love to snack on tomatoes since I was a small child) I could eat them regularly straight from the bush or in desserts. In a small bowl mix the apples and tomatoes, drizzle with lemon juice. In another small bowl, stir together 2 tablespoons flour, 2 tablespoons sugar, and lemon rind, then sprinkle all over the fruits. Toss mixture gently to coat fruits. Transfer into a baking dish. Bake in a preheated 375 degree F oven for 20 minutes. Prepare the topping while the fruits are baking: In a food processor, pulse together the flour, brown sugar, and butter. Add the hazelnuts and process until nuts are chopped fine. Refrigerate until needed. Sprinkle evenly on top of fruits and bake for another 15 minutes or until nicely browned and crisp. Remove from oven and let rest for 2 minutes. Spoon Nutella in a disposable icing bag and pipe thin strips on top of crisp. Serve warm or at room temperature. 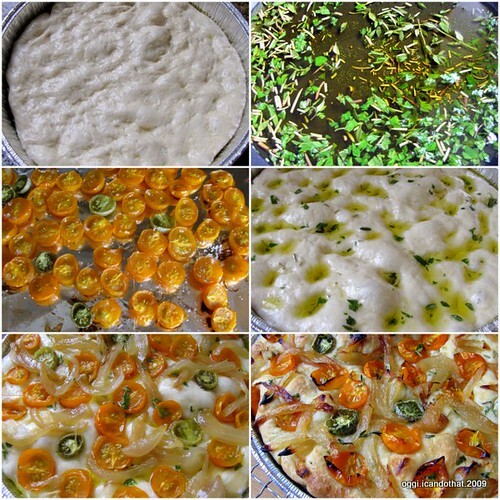 I'm submitting this post to Weekend Herb Blogging which is being hosted this week by Dhanggit. For more info on how to join this weekly event visit Haalo's blog. 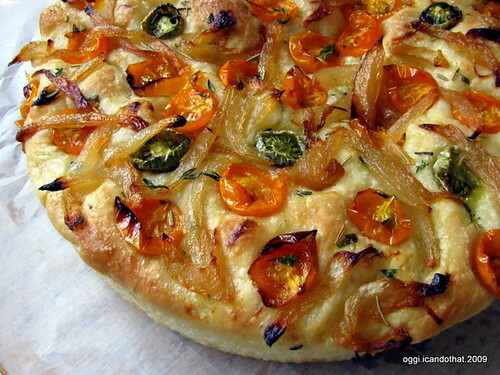 I was eager to bake Focaccia, 13th recipe in The Bread Baker's Apprentice Challenge but I was sort of disappointed after slicing the bread. Although very yummy and the crust crispy, I find the crumb, which has irregular large and medium air pockets, oddly soft and airy. 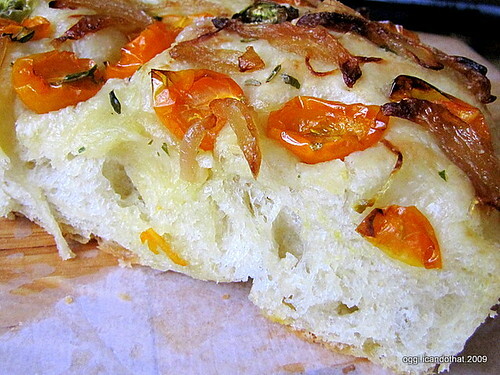 I prefer very chewy focaccia and the crumb of this focaccia definitely is not, at least to me it isn't. I don't know where I did wrong because I followed the recipe (using bread flour) accordingly, did not change any of the ingredients or procedure except I baked them pizza-style in round pans. I used 8 ounces of dough in 8-inch pans and 10 ounces in 9-inch pans and they baked to the perfect thickness of 1½ inches. On a positive note, I love the herbed oil and will use it again with different herb combination but I don't think I'll follow this dough recipe next time I make focaccia. Here is a better recipe, also from Peter Reinhart. I baked them in small rectangular loaf pans because I don't have the shallow rectangular ones for baking these cookies and I think they came out a little bit thick, I'm not really sure. I do have those boat tart molds but I can't remember where I kept them. Preheat oven to 400 degrees F. If using molds, place them on a cookie sheet. Transfer 2 tablespoons of the melted butter into a small container. Brush molds generously with the butter. In a medium bowl, mix together the almond meal, sugar, flour, and salt. Stir in the egg whites, the remaining 1/3 cup butter, and vanilla extract. Fill mini cupcake pan or molds almost to the top. Bake for 4 minutes. Remove from oven and top with fruits or fruit jam. Return to oven and bake until cookies are golden brown. Transfer into a wire rack and cool for 5 minutes. Unmold cookies and enjoy with frozen grapes.